I recently joined a 5th edition game of Dungeons & Dragons, playing Felix the human wizard (who happens to be smart, charismatic and particularly poor of health). Felix is based on two characters. Raestlyn of the Dragonlance Books, and a character from the novel I am currently writing. Sadly, I was unable to attend the last game. So one of the players wrote it up for me. Felix is not necessarily what you would call a nice guy (based on Raestlyn, remember?). I am using a descent miniature to represent him. 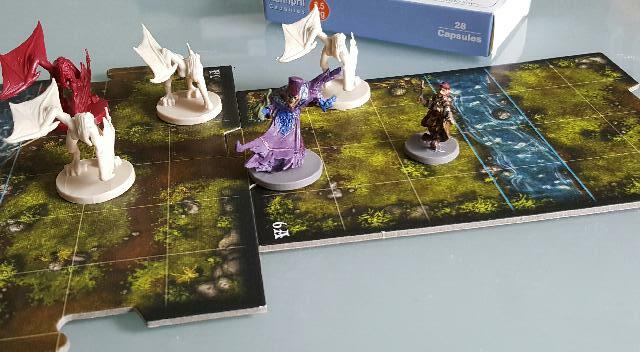 Ok, so the party were strengthened in number as, similar to their own method of arrival, the mysterious ghostly figure once again appeared by the ruined farmhouse they were taking shelter in and caught a wood elf who dropped from the sky. The mighty, brave, noble, greatly bearded dawi Dorik the mighty took chase after the apparition who floated across some treacherous rapids and disappeared. Dorik briefly thought about tying a rope around Alonzo and throwing him across the river, but the panicked look in the halflings’ eye was enough to dissuade him. Dorik did notice that there was a foul smell on the wind and following the stream up, discovered that while there was a channel of clear water running to the river, there was also a horrible stagnant bog all around it. Dipping his 10ft pole into one of the pools to try to see what was causing the stench, he discovered it only to be a few feet deep with thick, foul smelling mud at the bottom. Dorik thought of many uses for his now stench-covered 10ft pole. That night, on the last watch, the keen eared wutelgi was on watch and heard… flapping. Having previously brought down a Sturge near the camp, which had been preying on dozens of crows but still looked emaciated, the party was instantly on alert, except Dorik who (after rolling a 1 to wake up) took some extra rousing. Thinking quickly, our noble thief hid behind a wall, forgetting that it’s hard to backstab a swarm. Dorik took a brand from the fire and hurled it into the dark, illuminating a swarm of huge bats! The bats closed at great speed and the party barely had time to prepare, Dorik swung his axe wildly while falling back to the fire and knocked some down while cleaving others clean in half, the cleric set to enhancing the performance of others by praying to her bearded God, which was good because soon the bats would be thick in and amongst them. seeing his opportunity, Felix drew himself up and a torrent of natural 20 witch bolt surged out from his hands. Alonzo: Felix, on a score of 1 to the senate how evil are you feeling today? The bats (which for rule purposes count as one creature) were obliterated, the surviving few scattered into the night as Felix teetered on his feet before blacking out from a coughing fit, Dorik tended to him and soon had him stabilised though. The following morning the party explored the surrounding area, there was a desolate field with some strange holes and markings in it that caught their attention. Firstly, a number of rabbit holes, secondly a strange series of worn away markings, on closer inspection the Cleric and Paladin determined that these were from some kind of ritual, and done some time ago. Felix’s more arcane knowledge revealed that it bore extreme similarity to Necromantic arts that he had become aware of in his studies at the OU. Before the party had time to decide on the best course of action, they were beset by several swarms of skeletal rabbits! The cleric strode forth and began to turn undead, realising that with the magical speed of an undead rabbit, they would run themselves miles away before the effect wore off. She chanted, chanted, chanted, then realised that Turn undead is a level 2 ability and couldn’t do it. So hit them with her hammer instead, pulverising two with her first blow. The rest of the party joined in enthusiastically forgetting that piercing weapons are rather useless against skeletons, the great Alonzo successfully was useless. Likewise the nimble rogue was adept at throwing both his daggers down a rabbit hole, after throwing them right past the rabbits. So it fell to the Paladin, Cleric and Wizard to carry the day as the Elf decided to stand back and laugh. At the last, suffering only a nipped finger, Dorik held the last rabbit up and crushed in with a single hand. The powdered skeleton wafted into the air right into Felix’s face, who fell to another coughing fit as a result. I am sorry I missed the game, sounds like much fun was had!